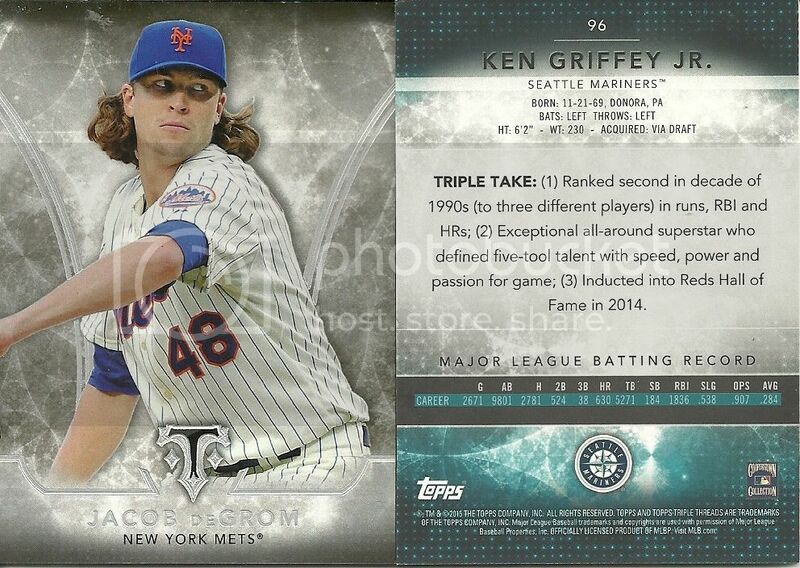 2015 Topps Triple Threads (TTT) base cards are thicker than standard issue card size.The card fronts feature a color action shot of the named player on a multi-tonal gray background. 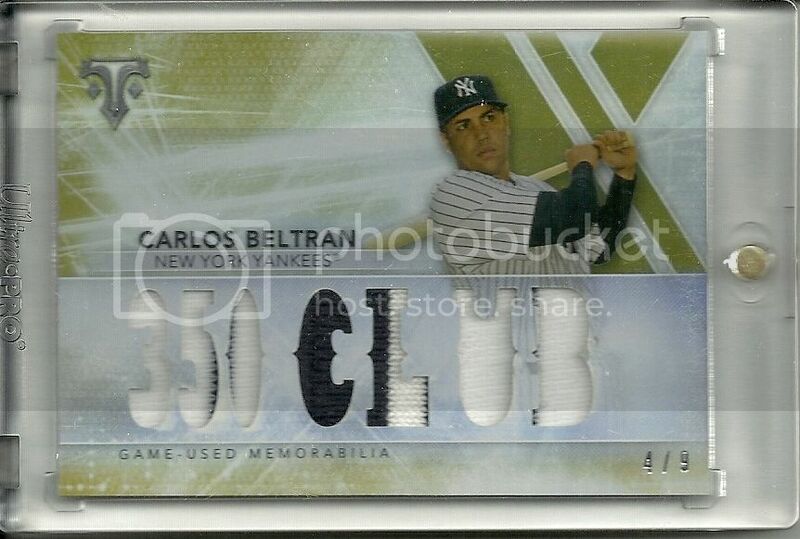 The border-less cards have simple silver foil highlights for the player name and set logo. The team name is centered along the bottom of the super glossy card fronts.The card backs are photo-less. the backs contain moderate biographical information, last year and complete career statistics and moderate career highlights entitled “Triple Take.” The card backs are trimmed with the team’s primary color and also contain a team logo. TTT is my second favorite release every year. It has all the characteristics of a high quality, and high-end product. 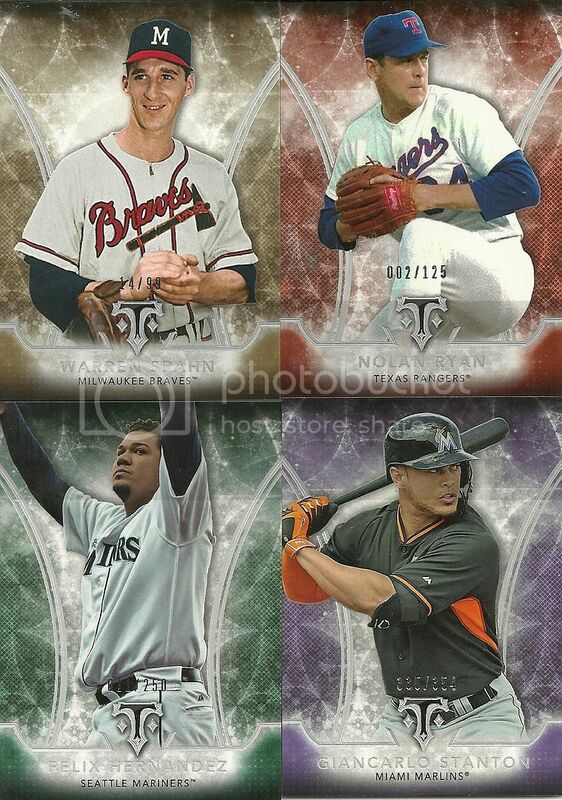 The progressive card designs and mix of current player, and retired stars get big marks form me. There are obviously several different serial numbered tiers of the base cards to chase all the way down to 1/1 white whale printing plates. the autograph is a sticker auto. While I would expect better from something the scale or TTT, the card at least is designed to fit the sticker As is customary with products of this type, redemption cards return. I personally have NEVER had good luck with redemption cards. I have only ever had 1 fulfilled for who it was supposed to be. Here’s hooping that Topps comes through with this one. An even better bonus if they picture him with his new team! Keep in mind that I am NOT rating TTT on set collect-ability. That being said, TTT is still a solid product, but collectors may still be better off buying the singles they want. If you buy a box, trade your Tigers and Rickey Henderson cards to me!